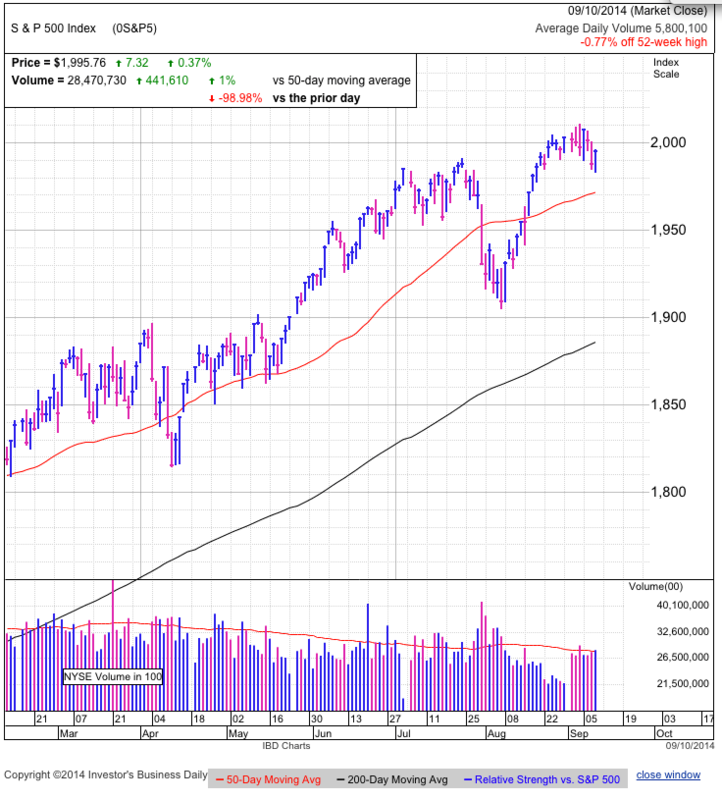 Stocks slipped on the final trading day of the third quarter, but remain inside the recent consolidation. 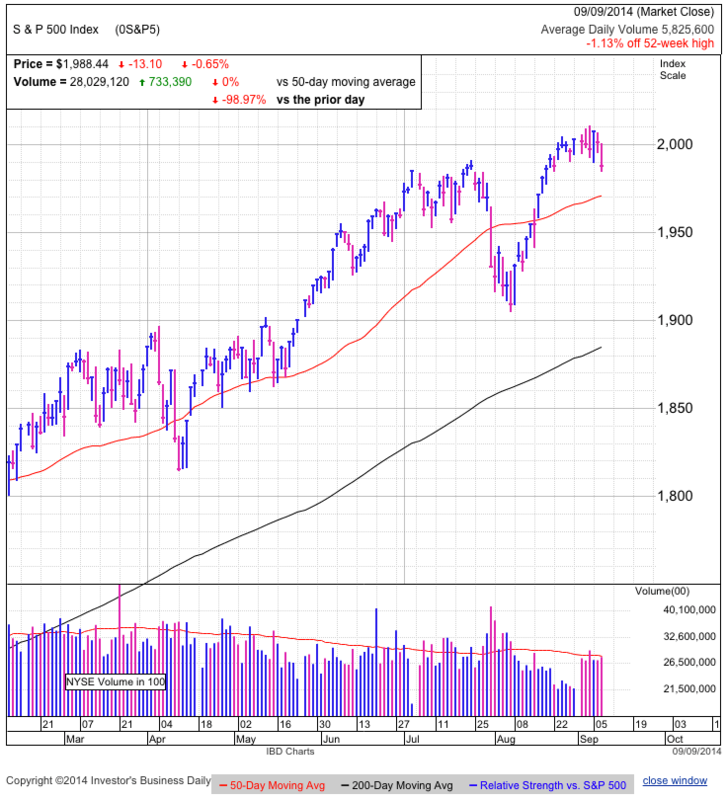 1,965 has been support over the last four days as the market struggles to reclaim the 50dma. But the problem for the optimist is markets usually snap back decisively from oversold levels, meaning we are not at oversold levels here. But that is only half the story. Most of the headlines filling the front page have been bearish. There is so much political discord in the world it takes more than one hand to count all the active hotspots. We also have persistent signs of economic sluggishness. And just tonight, the potential of a spreading pandemic. But for all the negativity, the market is only a couple percent from all-time highs. Is the market being naive, or does it know something the rest of us don’t? It is too easy to assume the market doesn’t have a clue and will eventually wake up to what is so obvious to the rest of us, but unfortunately beating the market isn’t that easy. More often than not, when we disagree with the market, we are the ones who have missed something. By default the market already knows everything we know since it is made up of people who have all the same information we do. Taper, rate hikes, Ukraine, Syria, etc. These stories have been around so long we can no longer call them news. Anyone afraid of these headlines sold long ago to someone who wasn’t afraid to own this risk. When there is no one left to sell a widely expected headline, it becomes fully priced in. When markets hold up the face of bad news and refuses countless legitimate excuses to sell off, it shows us it doesn’t want to go down. No matter what we think should happen, we have to respect the market’s resilience. Now it’s time to resolve the contradiction between a market that doesn’t want to go down with one that isn’t oversold yet. It all comes down to timing. In the near-term, the inability to bounce decisively and put the 50dma behind us means there is a good chance this selloff is not complete. Be prepared for one more dip under recent lows and testing support at 1,950 is a very real possibility. But rather than signal the start of a larger selloff, this will be the capitulation point before rebounding to fresh highs. Expect more near-term weakness, but this is yet another buyable dip. Stocks took it on the chin for a third day following Friday’s early surge to record highs. This dip leaves us less than 10-points from the 50dma and just above recent support at 1,980. The primary catalyst for this weakness appears to be a selloff in small-cap stocks. While the S&P500 is less than 2% from all-time highs, the Russell 2000 is off 8% and continues the shift from high-flying, speculation stocks to blue chips. 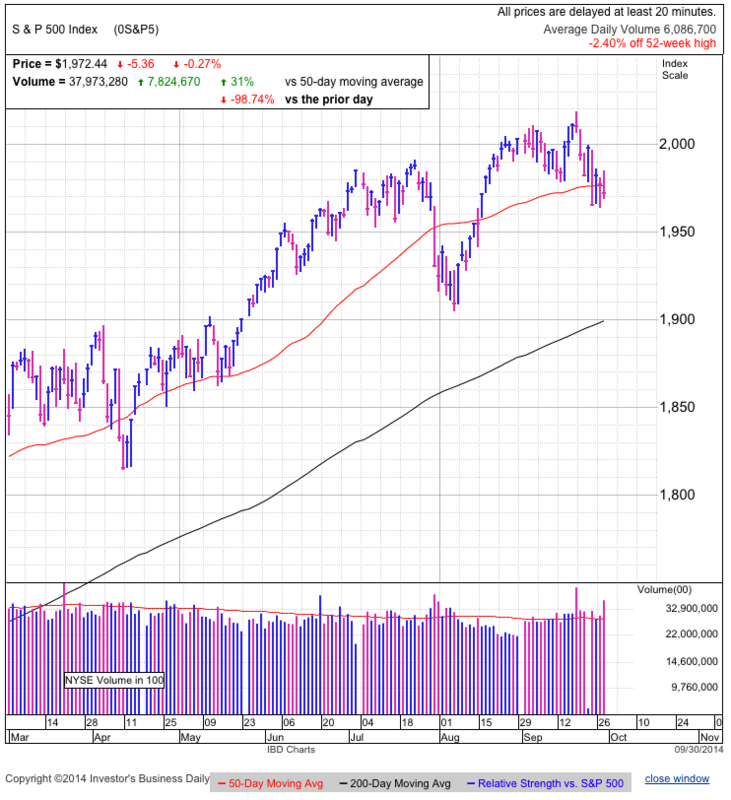 Wednesday will be an important day for the markets with a looming challenge of 1,980 support. This technical level stretches back to early July when it acted as resistance. But as we often see, resistance became support and we bounced decisively off this level a couple of weeks ago. 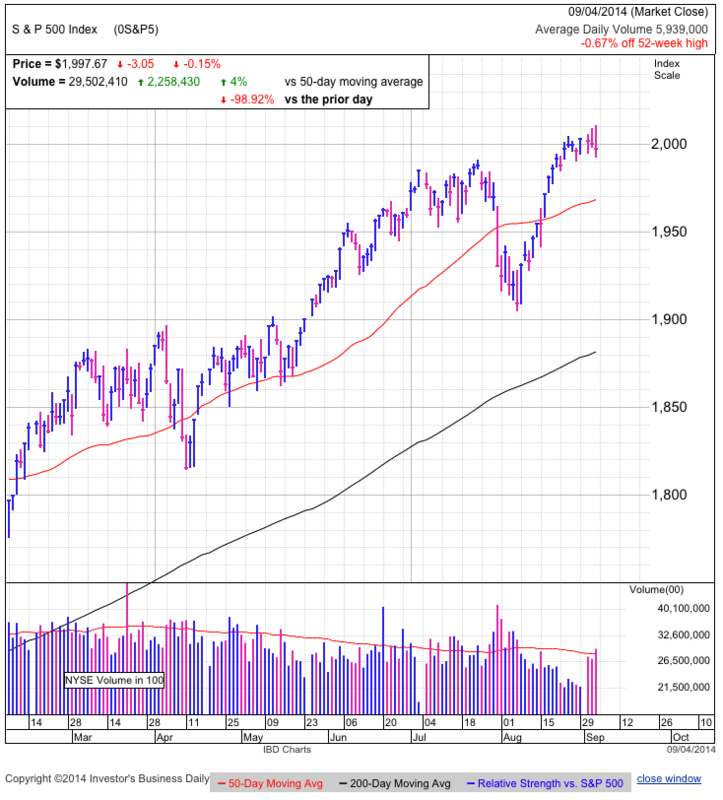 Will selling stall and buyers step in at this level again? We will know the answer in a few short hours. If stocks stop sliding, look for a rebound to record highs. On the other hand, failing to find support means we should expect the selling to continue to 1,950. While this sounds easy, the real challenge is not falling for the head-fake where the market dips under support, flushing out the reactive traders, before reversing and finishing the day higher. If this were easy, everyone would be rich. Market sentiment is cooling off slightly, but it remains at bullish levels. While overconfidence could ultimately cause the demise of this bull market, contrary to popular opinion, confidence and complacency is bullish in the short-term. Confident owners don’t flinch in the face of a 2% dip to support. The lack of nervous owners keeps supply tight and props up prices. This has been the story for the last 12+ months and there is no reason to assume the tide is changing here. We continue making higher-highs and higher-lows and the best trade is sticking with what works. Stocks fell further on Monday following Friday’s reversal from all-time highs. Volume was well above average as we broke under prior support/resistance at 2k. While the daily chart gives the impression the market sold-off through the day and finished weak, the intraday chart shows we found a floor in late-morning trade and moved sideways the rest of the day. While this seems like a minor nuance, it is actually fairly significant. The market gapped lower at the open and continued sliding fairly aggressively until just after 11am Eastern. This pushed us under the psychologically important 2k level and set off a wave of automatic stop-losses littered under support. But rather that accelerate the selloff, these stop-loss orders were the last of the selling before we found a bottom above 1,990. This weak price-action dared owners to join the selling, but most resisted the temptation and stood confidently by their positions. If this selloff chased off the weak, then all we are left with is the strong. While I’m not super bullish on this market, the stalled selloff shows supply dried up fairly quickly and that bodes well for a bounce to new highs in coming days. If the market finds support Tuesday, then the selling is done and we are headed higher. 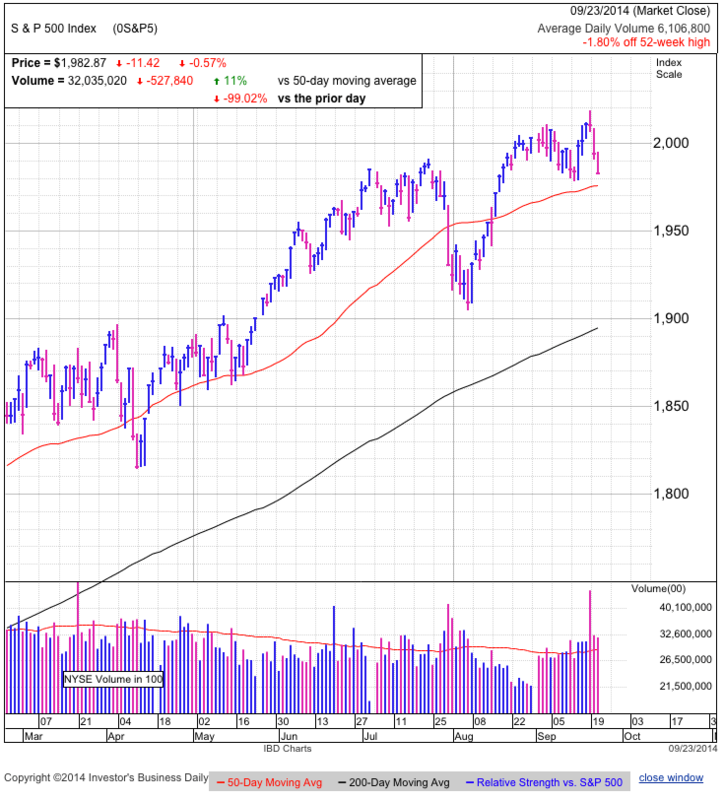 If we breach 1,990 and continue lower, then Monday afternoon’s support was a false bottom and the 50dma is in play. Trade accordingly. For all the hype over the Fed meeting, the market sure didn’t seem to care, finishing up a fraction of a percent. The thing we need to remember is those that hype up these events are in the business of selling eyeballs to advertisers. The more sensational they make the story, the more money they make. The Fed did a good job of not surprising anyone and is why we finished unchanged for the day. Bulls saw what they wanted to see to keep holding and bears got what they expected and continue shying away from the market. When no one chances their mind, we don’t get the waves of buying or selling that drives price moves. Volume was also fairly muted, only matching yesterday’s upside move. In a buy-the-rumor type of trade, we saw most of today’s strength come a day early. But that is how the market works. Wait to trade the headline and you are too late. This was just another potential stumbling block the market put behind it. While we could not hold on to the intraday highs, this is one more bearish catalyst we can cross off the list. If this market wants to keep going higher, no matter what we think personally, don’t fight it. Stocks bounced decisively from recent lows following some journalists comments about something. While we could waste energy talking about who said what, the only thing that really matters is how the market responded. We exploded higher because recent selling was overdone and all it took was one little catalyst to set off a buying frenzy. While bears will point to how meaningless the justification for the rebound was, they are missing the point. We didn’t bounce because of a reporter’s comments, we bounced because the market was oversold. Recent weakness flushed out many weak holders through a series of successive new lows. The pain trade convinced many that we were on the verge of a larger selloff. But we knew this selloff didn’t have legs when it kept undercutting prior support, but didn’t trigger a larger wave of technical selling. That told us most owners were content holding and were giving little attention to this minor move lower. When the masses don’t sell, supply stays tight, and we bounce. While the market is set up to continue higher, don’t expect fireworks. Market moves tend to be fairly symmetrical, so a couple dozen point dip is frequently matched with a couple dozen point breakout. While it seems like 2,020 is easily in reach, we need to watch how the market trades at this level before deciding what to do next. 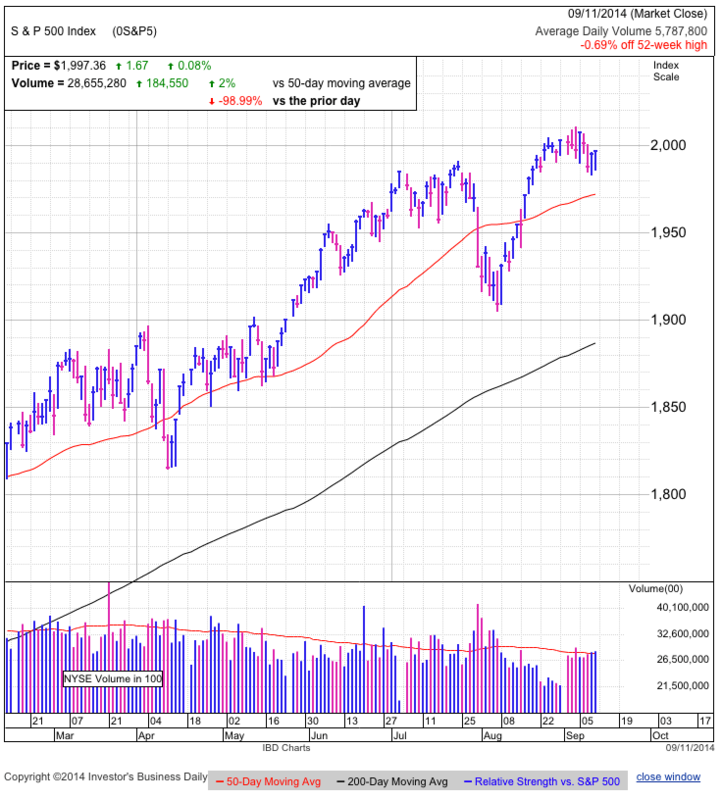 Traders have been reluctant to buy above 2k and if this trend continues, the rally could stall on a lack of demand. Wednesday we get the Fed policy statement and Yellen’s press conference. Expect some short term volatility as some traders impulsively react to the headlines, but its been a long time since a Fed action moved the market for an extended period of time. We rallied through easy money and now we’re rallying through taper. If the Fed continues to play their cards well, this statement will be ancient history by Thursday. 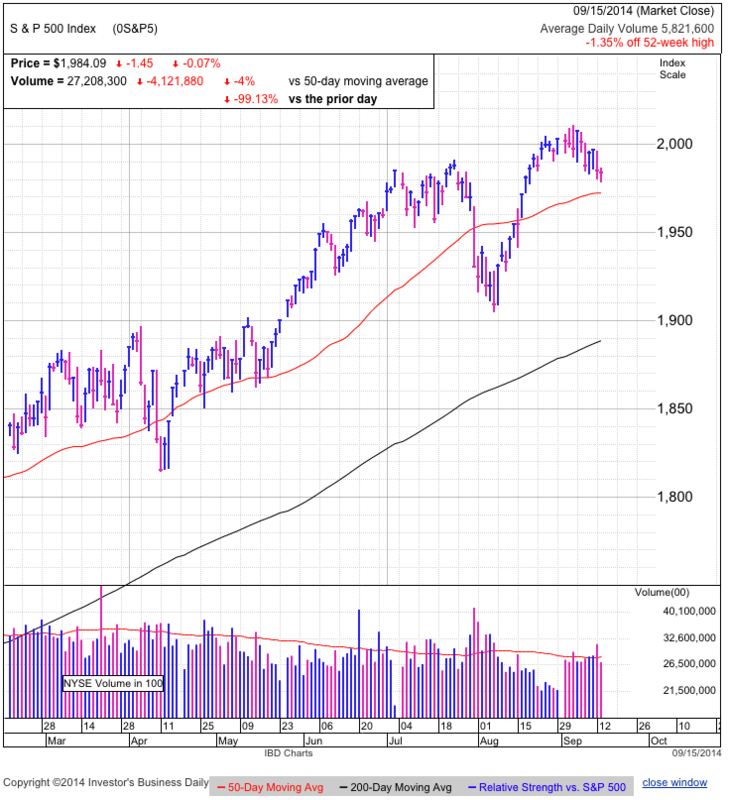 A tale of two markets; while the S&P500 ended flat, the NASDAQ and small-cap indexes cratered 1%. The divergence shows investors were pulling away from speculative technology and small-caps and moving that money into boring blue-chips. Similar to the phenomena we saw back in April. While one day doesn’t make a trend, it would be foolish not to take note. Tuesday is the start of the Fed’s meeting and is a popular event for the market to speculate on, but while Fed meetings, notes, and press conferences generate lots of buzz in the financial press, they haven’t done much to change the mood of the market. Last year everyone dreaded the very mention of Taper, yet here we are, practically done with Taper and yet holding near record highs. So much for conventional wisdom. Outside of raising short-term interest rates to 5%, I doubt the Fed meeting will have a lasting impact on the market. Of course we should expect near-term volatility as traders impulsive react to a stray word or two. The market is at an important turning point. What happens next could determine how we trade the rest of the year. While we are holding near record highs, we are seeing a slight roll off from the top. Quite bullishly, we haven’t seen recent dips under prior lows trigger waves of technical selling. This shows most of the people who fear weakness already sold this consolidation. Those that remain are demonstrating they don’t mind a dip here or there. As long as they remain confident and complacent, supply stay tight. But at the same time, we are rolling off in what could be a double-top or head-and-shoulders. One move, two legitimate interpretations. If this were easy, everyone would be rich. We are a few points above the 50dma. Bulls need us to bounce over the next few points. Fail to hold the 50dma and it could be a very rough few weeks for the market as previously confident owners turn into nervous sellers. Trade accordingly. As with most things in life, it isn’t how you start, but how you finish. Again the market opened weak, but found a bottom in early trade and proceeded to climb into the green by the end of the day. There is a laundry list of reasons why we should selloff; geopolitical tensions, weak domestic growth, stalled European growth, Taper, this bull is five years old, etc. But if there are so many reasons to selloff, why do we keep trading near record highs? The quick and dirty reason is those that don’t trust this market sold long ago and no longer have a vote in what comes next. Markets move when traders change their outlook and either buy or sell stock. Those that don’t trust this market continue staying out and those that believe in it keep holding. As long as those that own continue believing every dip will bounce, they will hold any weakness and the market quickly bounces on the resulting tight supply. Those that criticize this market from the outside gave up their right vote, so the people we need to pay attention to are stock owners. As long as they remain confident and complacent, the market will stay strong due to a lack of supply. Today’s failed selloff shows there is no bite to the bearish thesis. Markets stretched to overbought levels will snapback within days. We’ve been hanging around 2k for nearly three weeks and had multiple invitations to selloff. This resilience demonstrates the market is not over-extended….yet. 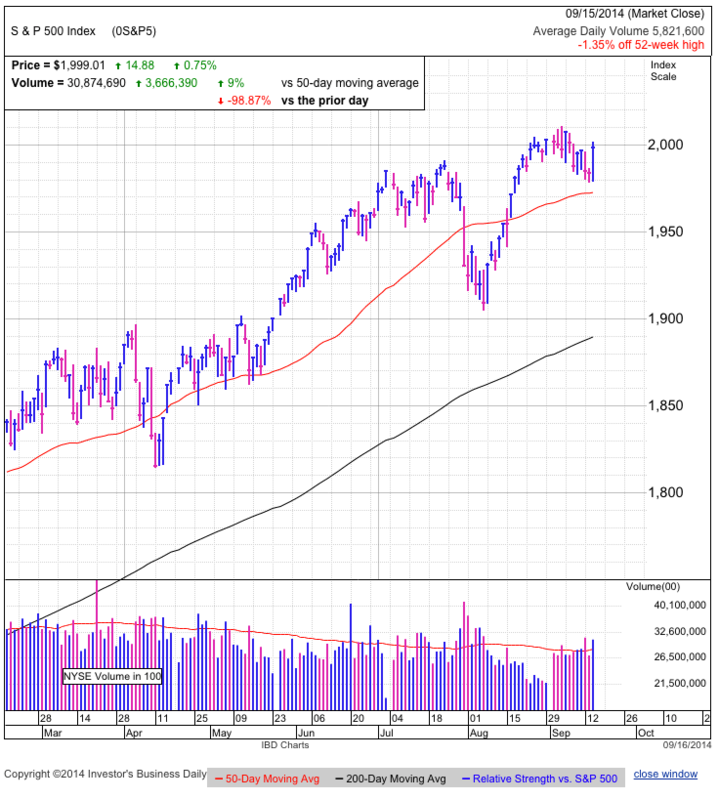 The smart play is sticking with the rally in the near-term. After 2,010, what happens is anyone’s guess. If we explode past 2,010 unsustainably, then that could finally be the top bears have been waiting for. But if the market rallies smartly and deliberately, look for this to set the mood for the remainder of the year. Stocks slipped under Tuesday’s lows in early trade, but bounced off of 1,983 and never looked back. The noteworthy thing is we broke support, but no one sold. That tells us most of the people who wanted to sell have already sold. Owners that watched the early morning weakness, shrugged it off and we bounced on the resulting tight supply. This most likely means we are headed back to the upper end of the recent trading range near 2,010. While not a large move higher, it shows us the market is not poised to breakdown. Another tough day for the market, notching the fifth loss out of the last six trading sessions. Taken out of context, that sounds like a horrific stretch, but each loss has been so modest we are only down one-percent from all-time highs. Like everything in the market, there are two ways to interpret this. Bears will point to all the distribution, while bulls will claim how meaningless this distribution’s been. Which sides is right? That’s the million-dollar question. Volume returned to nearly average levels since we came back from the holiday break. This shows institutional money is playing a larger role as we head into the busier fall-trading season. Even with the elevated trade, the market’s been successful at finding a buyer for every seller and we continue trading near the psychologically important 2k milestone. While it is concerning buyers don’t want to chase prices higher, at the same time it shows owners are content and not taking profits. When owners don’t sell stock, supply remains tight, propping up prices. Markets typically retreat from unsustainable levels fairly quickly, so spending nearly two-weeks around the 2k level shows broad support from buyers at these prices. But what we don’t know is how deep this well of support is. 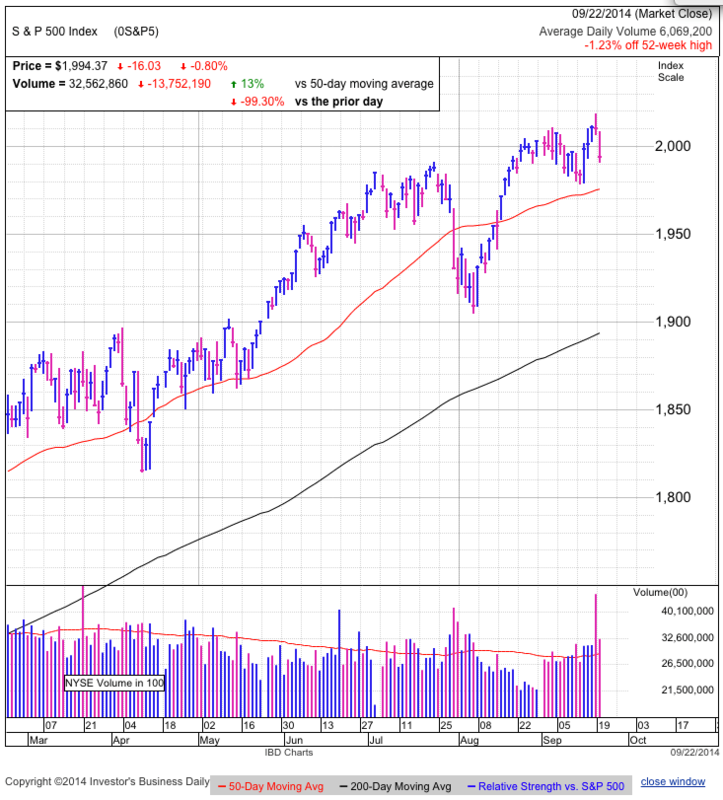 Will we continue to find an ample supply of buyers ready to buy today’s 13-point dip? We will know the answer on Wednesday. While Tuesday’s trade pushed us under recent support at 1,990, it didn’t trigger a larger wave of selling and we quickly bounced off of 1,985. The big test for Wednesday’s trade will show if this was yet another head-fake whipsaw around 2k, or the start of the next directional trade. If breaking support fails to trigger a larger selloff on Wednesday, look for the market to bounce back to new highs in coming days. On the other hand, continued selling shows we are running out of buyers and it will only be time before the weakness converts previously confident owners into nervous sellers. Today was one of those days that make you stand up and take notice. The ECB surprised everyone with their unexpected rate cut, but rather than rally on all the free money, US stocks sold off from early gains. When markets selloff on good news, watch out! There are always two ways of looking at things. Until this point, quantitative easing was seen as a good thing and our markets are up huge since the US Fed started the program a couple of years ago. But there are two sides to every story and it seems the market is taking the contrarian view with the ECB rate cuts. Rather than embrace the easy money, the market became concerned this unexpectedly aggressive action is required to keep Europe from falling apart. The means market is starting to reconsider how little risk premium it is currently carrying at these record levels. Markets frequently overdo things on both the upside and downside. This rally defied all the naysayers over the last two years, but every good thing must come to an end. Are we there yet? If the market continues to struggle in the face of normally good news, that is a strong warning to us. Friday morning we have US non-farm payroll. 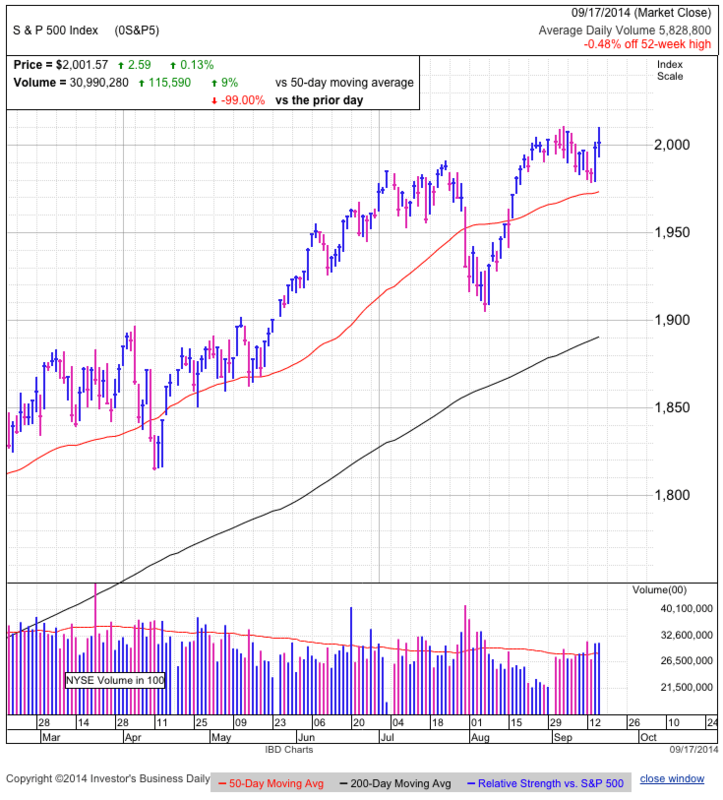 I expect a respectable number and a modest bounce in equities, but if the market fails to gain traction and recover Thursday’s weakness, we could see more selling in the near-term. The best trade over the last two years has been buying every dip, but failing to hold the 50dma so soon after reclaiming it shows many investors are no longer throwing money at this market and we could be in the early stages of a larger correction. Continued weakness on Friday gives us an interesting shorting opportunity, but brushing off Thursday’s weakness and closing strong shows the market is ready to continue higher.